The Hand and Lock Prize is awarded yearly for skill and vision in fashion and art embroidery. There are few crafts that can preserve history and communicate social status the way embroidery can. A rich storytelling medium with infinite material possibilities; embroidery enhances character, tactility and emotion in fashion and interior design. One British brand working hard to communicate the potential of embroidery is Hand & Lock. From adorning military uniforms to encrusting royal gowns, Hand & Lock pride themselves on 250 years of hand embroidery excellence and heritage. Born out of this longstanding experience 'The Hand & Lock Prize' was established in 2000 providing a fertile ground for emerging and established designers to create hand and digital (from 2017) embroidery pieces under expert mentorship. Tactile Trends were keen to learn more about the 2017 participants and the 2018 brief. Continue reading for our favourite category highlights and an exclusive Q&A with Hand & Lock. Winner of The Hand & Lock Textile Art Embroidery Category. Elena Thornton explores the tropical night blooming 'Cereus' flower in her three time prize winning face and neck adornments. Colour and patterning takes inspiration from macro aspects of the flower employing cutwork, beadwork and goldwork amongst her embroidery techniques; the overall result showing a modern and sculptural embroidery aesthetic. You can see more of Elena Thorntons work here. Victorian era hairwork jewellery inspired the winning fashion piece in the Hand & Lock Prize student category. Stav Ofmans bridal gown is embroidered using synthetic hair to form the floral elements and also features plaiting. Some of these embroidered hair techniques date back to the 1400s where they were given as memoirs in the absence of photography. You can see more of Stav Ofmans work here. 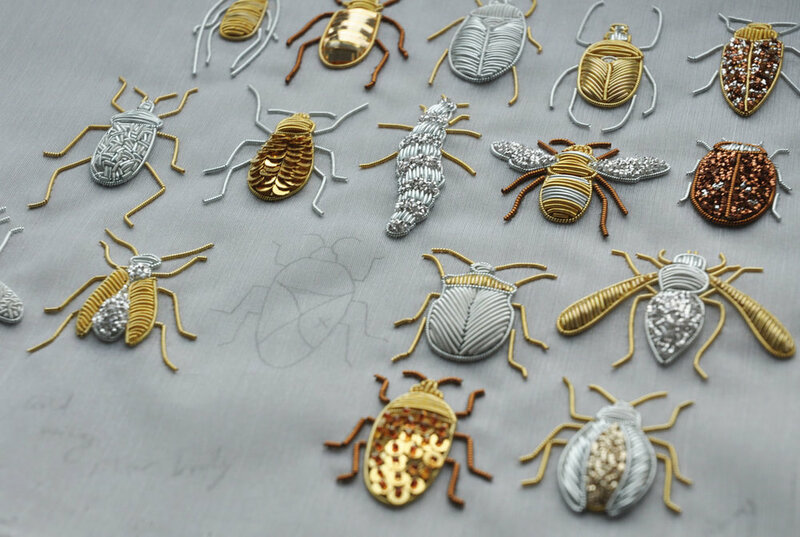 Hannah Mansfield celebrates endangered and threatened animals and insects in her embroidery pieces. 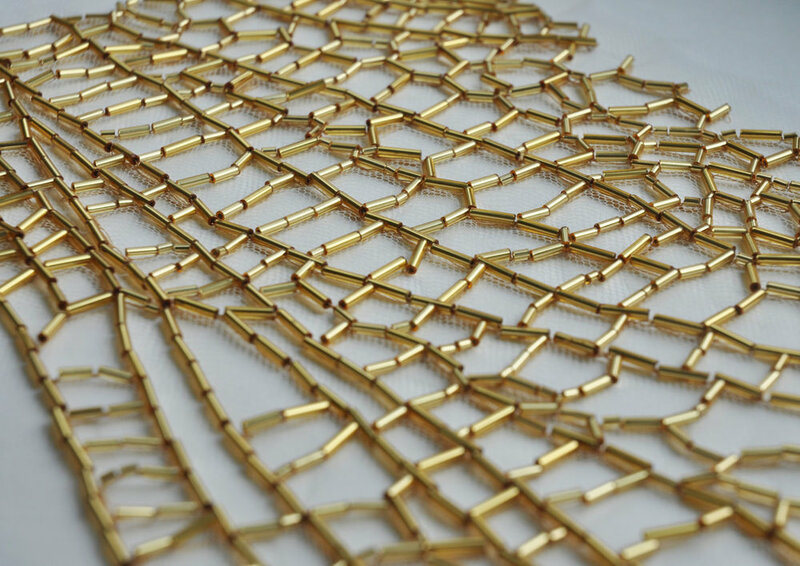 Tambour beading and gold work techniques in a honey toned palette takes inspiration from the bumble bee. 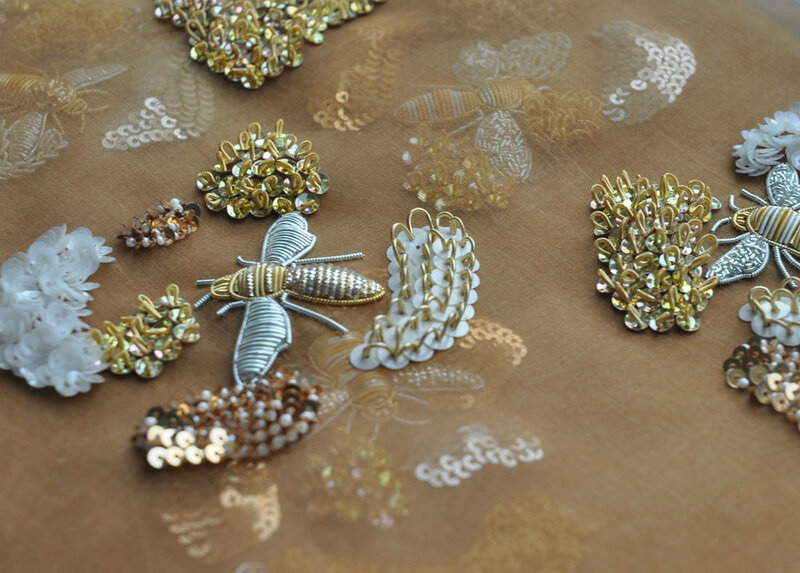 Drawing parallels between the bee keepers veil and honeycomb structures by using tulle and bugle beads emphasizes the storytelling potential of embroidery as a medium. You can see more of Hannah Mansfields work here. 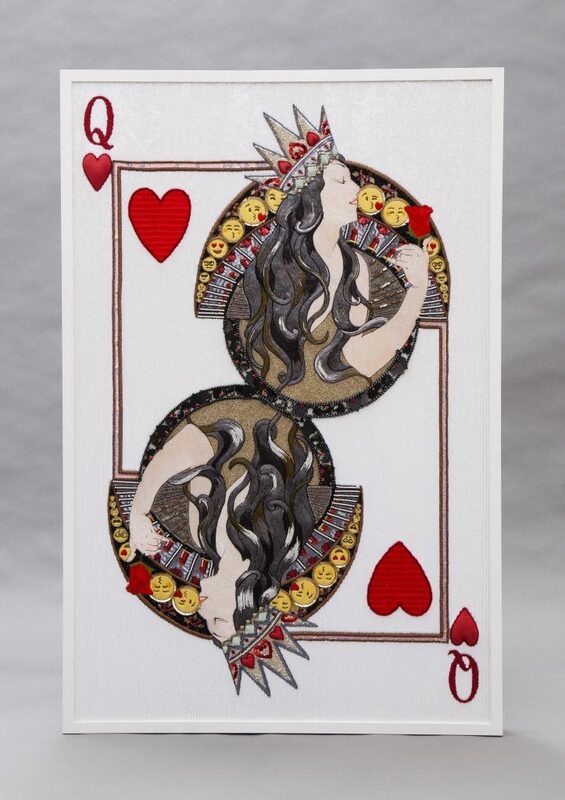 Kayleigh Mace excels in machine embroidery and manipulates it to fascinating effect with digital fringing in combination with hand embellishment. This is a great example of the design diversity you can achieve when using hand and machine techniques together in one design. You can see more of Kayleigh Maces work here. Raychel Murphys work is a perfect example of the growing trend for word embroidery but what makes Raychel stand out is the satire and black comedy she throws into the mix. You can safely say her wit is as sharp as her needle! The use of potent messages contrasting with light transparent fabric bases and traditional motifs make her messages almost shout off the fabric. You can see more of Raychel Murphys work here. We asked the team at Hand and Lock a bit more about the prize in this interview. The Hand & Lock Prize was established in 2000, how have the winning embroidery designs evolved over the last 17 years? As the competition has grown and we've added a live judging event the embroidery submissions have evolved from samples to full garments and pieces of textile art. The overall style of embroidery is as eclectic as ever but each year the standard of work improves. We also find that each year there is at least one piece that is a genuine showstopper that delivers a massive wow factor for whatever reason. This has been evident in the perspex glass piece by Emily-Rose Spreadborough in 2015 and Sally Wilson's sculpture in 2016. In 2017 there were maybe four pieces that would be considered 'showstoppers'. You could say they have evolved from modest embroidery samples into showstopping embroidery masterpieces. Winning designs are judged on concept, execution, construction, embroidery skill and overall presentation. How did the winners from 2017 excel in meeting these requirements? The Brief for 2017 was 'Celebrate' and this was represented in so many interesting ways. Stav Ofman represented it through honouring family memories and celebrating a wedding union. Her piece, a contemporary interpretation of a wedding dress featured synthetic 'hair flowers' that paid homage to a tradition in her family of saving the hair of loved ones and turning the strands into small flowers. This reflection of the personal and the public celebration in one piece, executed so well really seemed to inspire the judges. It had ingenious construction techniques as well as genuine skill in the application of the embroidery. And most importantly it had a real wow factor. Another winning piece by Ada Zhang had a less obvious interpretation of the brief but was very laden with impressive embroidery work, design sensitivity and overall wow factor. At Hand & Lock we specialise in goldwork and this technique has a lot of traditional connotations. We always love it when an entrant takes goldwork and uses it in a dynamic modern way. Zhang used coloured bullions thoughout the submission and combined this with tambour beading and silk shading. It was a truly impressive piece of multidisciplinary embroidery work. All the winners this year succeeded by meeting or exceeding at least one area of the judging criteria. For the 2018 Hand & Lock prize brief you have chosen a theme called ‘Material Alchemy meets Modern Morality’. Can you explain how you arrived at this theme and why it is relevant for the 2018 prize? The Brief is written by Polly Kenny at the London College of Fashion and is produced to be integrated into the teaching curriculum at design schools all over the world. The other key element of the brief each year is that it has to be interpreted as if it were a client's brief that the embroiderer needs to adhere to and interpret. Polly looks at the most recent literature and the emerging trends in fashion to arrive at her brief. The hope is that it is always relevant, challenging and exciting. This year we were all interested in looking at 'transformation', 'society' and giving entrants an opportunity to use transformative embroidery technologies or techniques to express statements about what it means to live in this world. We are inviting entrants to get political, to be critical and to express their own opinions. History and costume play a big part in inspiring fashion and textiles, are there any periods in history that have particularly influenced the 2017 prize submissions? The brief was broad and the categories included digital embroidery and hand embroidery - the entrants called on so many sources, embroidery styles that it's impossible to pin a period down. By it's very nature, embroidery has a sense of costume about it and feel theatrical and glamorous. If anything maybe some of the piece could belong to a bygone era of avant garde haute couture. In 2017 Hand & Lock added a digital embroidery category to the prize. What different techniques and processes can designers explore when creating with machine vs hand? Over the last few years we have seen a combination (sometimes within a single submission) of techniques such as hand embroidery, hand guided machine and digital. In addition to these designers often use cornely, trapunto, laser cutting, 3D printing and hand embroidery in their submissions. Designers in the digital category who combine other 'machine' led techniques can create amazing, exciting submissions but are often limited by the tools, machine's and software they use. With hand embroidery the only limitation is time and patience. The machine aids with speed especially for repetitive tasks - but the hand embroidery is almost always more artful. As a competition we encourage cross pollination of techniques. We welcome a touch of machine for a hand embroidered submission, and a bit of hand embroidery in a digital piece. The best embroidery, like the best art, has to break the rules. Wearable technology is advancing at a rapid pace, how do Hand & Lock predict smart embroideries will develop in the future? Wearable tech is already appearing in sportswear and there are even coats available that can charge your phone in your pocket. I think it will remain a high street novelty for a few more years and continue to be embraced by cutting edge couturiers such as Iris Van Herpen. It will take a while longer for 'smart embroidery' to permeate the public realm. Clothing has become a disposable commodity to most and the idea of smart clothing is in opposition with that idea. Smart embroidered clothing is a step further, still. Smart objects such as a phone are expected to last through the seasons. Smart embroidery will likely gain a foothold in accessories first, there is a natural affinity between jewellery and embroidery. Prize entrants are encouraged to explore this in 2018 and we hope to see some really innovative new ideas. How has the Hand & Lock Prize fostered and promoted creative talent in embroidery? This is the mission of the Prize. We created the mentoring programme withing the Prize process to help knowledge and know-how circulate. What advice would Hand and Lock give to emerging and established designers that want to incorporate embroidery into their designs? Embroidery is a whole discipline in it's own right. If designers really want to incorporate embroidery into their designs they need to take the time to learn about the techniques, take a class or attend a specialist embroidery course. Much of the time a fashion designer might outsource embroidery and that means it is vital they understand what they are asking for so they can push the design to the limits but still keep it in the realm of what is possible. Besides this they should study the embroidery of the past. Fantastic exhibitions are always touring the world and exposure to the work of others will inspire them. Modern high street embroidery that we see everyday can be a little underwhelming...designers need to seek out the best embroidery and really examine it. Figuring out how complex embroidery was made is the key to making your own complex and exciting embroideries. To see more Hand & Lock Prize winners you can head over to their dedicated Instagram account here. Meanwhile lets look forward to more exciting embroidery talent under the 2018 brief of 'Transformation'. We will keep you updated for sure!